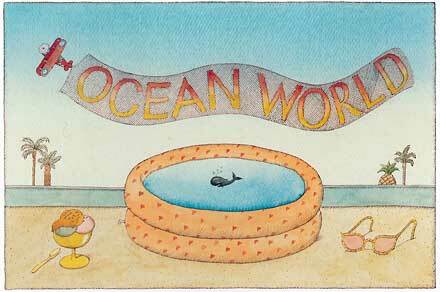 On the back of this card we can read a message from Peter Sis to his children: “Greetings from Ocean World! This morning I saw a whale who has been here since she was just a few weeks old. Soon the day will come when she will be returned to the ocean to live with others of her kind. She has seen many people but has never seen another whale. I wonder what it will be like for her! Love, Peter” Peter Sis has two children, Madelein and Matej, both born in America. He himself was born and raised in Checkoslovakia during the grim years before the fall of the Berlin Wall. But I digress. Back to the whale. We see her growing up as the years pass, and soon she is too large for her tank at the aquarium. But also sees many sad things – as sunken ship, a barge hauling trash and poluting the sea. Just when all seems hopeless and she swimss away – what is that on the horizon? You can read more about Peter Sis here and here. This is a interview with him by some children and here is an article about another book of his, “The Wall” an autobiographical account of his years growing up in Checkoslovakia. Here is Peter Sis speaking about his children, and here about how he had to change his artmaking when his children were born. Here he is talking about his book “Tibet, through the red box”. I received “an ocean world” as a gift to me some days ago. But, the last paint is not as above description. It means there is no the page of “rainbow between whales” neithter in the last page nor the back cover.